Almost all the activities of humans daily now are now depend on too many forms of energy. It’s Known that Energy is the ability of a System to carry out work. Physically speaking : Energy also has the ability to be transformed form one form to another. Of particular practical importance are thermal and electric energy. Energy which is Stored within physical system due to the position “Differences in altitudes”. Energy which is caused as the results of the body motion. Energy That stored deep down in the center of the earth as a result of a high temperature. Energy which It can be released due to a chemical reaction. Energy that released during a nuclear Reaction as a result of a fusion ,It also called “Atomic Energy”. Humans started to use hydro energy since the beginning of civilizations. Since when they were burning wood for heating and lighting. Mainly water power was considered as the main source of energy that was used to generate mechanical driving power, As The Water streaming from higher levels to lower levels consists of a potential energy in itself because of its altitude ,Then This potential energy is converted to a kinetic energy while flowing downhill.Those forms of energy together contribute to what we so called Water power or hydro energy. 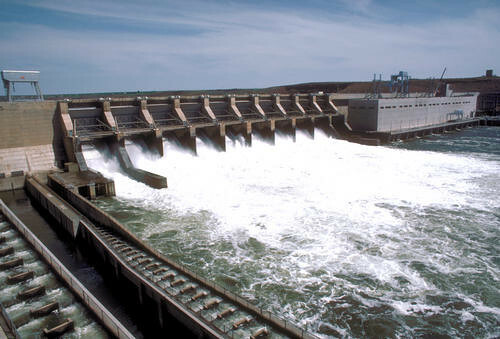 Water power of hydro power is considered to be one of the most efficient renewable energy source out there ,It’s renewable energy because it is renewed continually in a natural way. Water is available everywhere on the planet. As It covers approximately 70% of the earth, It keeps going around and around through too many different forms and phases which called water cycle. In some parts of this water cycle ,The water is a Solid “Ice” ,In other parts the water is a liquid “Rain” or it is a gas “water vapour”. The whole process starts when the sun vaporizes water from oceans ,rivers and lakes also the sun vaporizes the water from the plants and the soil on the land, this water transforms into a gas or a water vapour through a process called “Evaporation”.This water vapour tends to be cooler as it rises into the atmosphere. Then it gets through a process called “Condensation” ,As the moisture holding capacity of the warm air more then the cool air on a high altitude ,some of the water vapours turns into water droplets. Then these water droplets tend to be bigger and larger droplets so due to their weights ,They fall to the earth in form of rains or snows. Much of the water that to earth tend to flow in streams to oceans ,lakes and rivers. Some of This water becomes Ice ,and some get soaked into the ground. After The water cycle is done ,The water finds its way back to oceans lakes and rivers ,and then the whole cycle starts all over again. During The water’s Journey back to the Sea ,It’s energy is used for generating power through hydro power plants. Almost all the forms of energy including hydro energy are derived from solar energy ,as the sun’s light plays the main role in all process, and about 22% of solar energy is consumed for the formation of rains ,which is the main Source of the hydro energy.